The Cartography and Imaging Sciences Discipline Node (aka "Imaging Node") of the Planetary Data System is the curator of NASA's primary digital image collections from past, present and future planetary missions. Imaging provides to the NASA planetary science community the digital image archives, ancillary data, sophisticated data search and retrieval tools, and cartographic and technical expertise necessary to develop and fully utilize the vast collection of digital planetary images of many terrestrial planetary bodies, including icy satellites. Imaging science expertise includes orbital and landed camera instrument development and data processing, data engineering and informatics, planetary remote sensing at UV to RADAR wavelengths, and cartographic and geospatial data analysis and product development. For a guide to Imaging Node services download the PDS Imaging Node Tour. This image was acquired on September 6, 2018 by NASA's Juno spacecraft. A long, brown oval known as a "brown barge" in Jupiter's North North Equatorial Belt is captured in this color-enhanced image. April 1, 2019: The 67th Mars Odyssey release has occurred. The data may be accessed at the online data volumes and via the Image Atlas. This data is accumulating. March 15, 2019: Data acquired through Sols 2128-2224 is now available for MSL HAZCAM, NAVCAM, Mastcam, MAHLI, and MARDI and are available via the Image Atlas. PLACES data are also available for Sites 1-73. March 15, 2019: Data for LRO LAMP and LRO LROC are now available via the online data volumes and the Image Atlas. March 1, 2019: The 48th MRO release has occurred for CTX, MARCI, HiRISE data, including DTMs, for data acquired June, 2018 - August, 2018. The data can be accessed via the online data volumes. Data for HiRISE anaglyphs is also available. HiRISE data, including DTMs, is available via the Image Atlas. February 13, 2019: Version 4.1 of Cassini ISS calibration volumes are now available. Superseded versions are also available. 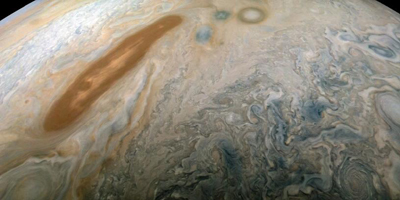 February 11, 2019: JunoCam data for ORBITS 13, 14 and Global Maps are now available via the Cartography and Imaging Sciences Node online data volumes. Visit the PDS Juno Mission page here. December 28, 2018: Data for the latest MER release, acquired on Sols 5041-5130. The data is now available through the online data volumes and via the Image Atlas. This data is accumulating. July 3, 2018: Search capability is available via the Image Atlas. July 2, 2018: Cassini data covering July 1, 2017 through September 14, 2017, have been released at the PDS Imaging Node for ISS volumes 115 & 116 and VIMS volumes 93 & 94. May 2, 2018: Data from Lunar Orbiters 1-5 is now available through the Image Atlas. February 6, 2018: The PDS Cartography and Imaging Science Node is pleased to announce the first and only release of the Lunar Orbiter Image Recovery Project (LOIRP) online data volume including lunar surface reconnaissance imagery from Lunar Orbiters 1 through 5. January 25, 2018: The final radiometric calibration of the mission for the Visual and Infrared Mapping Spectrometer (VIMS) on Cassini is available in the Cassini archive and a report describing the calibration is also available.